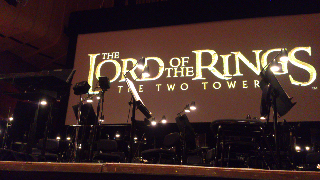 I missed out on the Sydney Symphony's Lord of the Rings: The Fellowship of the Ring concert last year, mainly because I had blown the concert budget. But also because I attended the SSO's Lord of the Rings Symphony way back when the composer, Howard Shore, conducted it. Truth was that I was a bit disappointed at the lack of the original exotic instruments and hence a different sound. The SSO has got me before like than, most notably with Tan Dun. I've probably blown my concert budget again this year (whole family down to Melbourne for the Doctor Who Symphonic Spectacular) but I waited until the cheap restricted tickets were released for the SSO's LOTR: The Two Towers performance. Okay it meant restricted vision, but I was there for the music. In my opinion the music of the Two Towers improved upon the first installment's. I first really listened to the soundtrack while on holiday in the South Island of New Zealand, and there can be no more appropriate place than that. The deal with this performance was that the music would be performed by the orchestra while the film was shown on a big screen above. I didn't expect that the dialogue and effects tracks would also be played, but they were. I couldn't see the point of that, as you can always watch the movie in the comfort of your own home in that case. It's difficult not to focus on the film because it is rather good! I was seated in the middle right section of the very front row, but I still had decent vision of most of the screen. Unfortunately, I found the nearby speaker rather distracting and confused my localisation of sound from the orchestra. Still, that was a minor issue. The other downside of the seat was that I could only see the conductor and the front strings sections, when vision of the rest of the orchestra would have been interesting. I shouldn't complain though, the tickets were discounted. Unlike my last few experiences with the SSO, the performance was generally excellent, with only a few minor wobbles from the brass section. The sounds seemed genuine, though I do wonder if it was actually a hardanger (Norwegian fiddle) used for the Rohirrim scenes as the chief violinist's (she did the solos) instrument looked the same as a normal violin, except there were electrical wires emerging from it. Sound modification or just a soloist's microphone, I wouldn't know. The two choirs, the Sydney Philharmonic and Sydney Children's were both fantastic and the solo vocalists Clara Sanabras and Sebastian Pini were wonderful. The Opera House's acoustics again seemed to detract from the overall sound. It's a pity that this wonderful piece of architecture just doesn't support the perfomers properly. Will I attend the final installment, The Return of the King? Quite possibly. I'm sure that it will be staged because all sessions of The Two Towers appeared to be virtually sold out. The applause at the end lastest as long as a Peter Jackson battle scene: The Extended Edition. Oh it is such a joy to use Microsoft based technologies. Needed a Sitecore (A .Net based web content management system) API reference. So far as I could see it was only available on their developers network as a Windows help file. Download file. Double click. Can't view contents. Need to go back on the web and search to discover that you need to go back into the properties of the help file and click "Unblock". Nowhere does Microsoft make that obvious. If I were using an open source CMS then the APIs would probably be in nice searchable and commented HTML files easily available on the web. What's that, an even smaller Sony computer than my VAIO P? No! 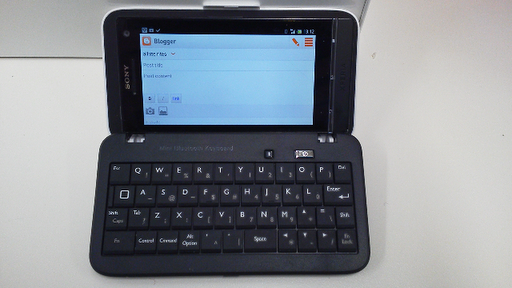 It's my Sony Xperia S mobile phone paired up with a Elecom TK-FBP029 bluetooth keyboard. With its 1280 x 720 pixel screen and Android operating system the Xperia S makes for a decent and highly portable computer. However, I find the touch screen keyboards of mobile phones too inaccurate for substantial typing. There are also issues with the on screen keyboard using up a lot of screen space when accessing our corporate Outlook web mail site. So on my last trip to Japan I went in search of small keyboards that I could easily carry around with me. Naturally there were plentiful iPad/iPhone compatible keyboards, but the Android selections were more limited. The keyboards were either too big or, in the case of the folding keyboards, too flimsy. I fell in love with the TK-FBP029 despite the packaging stating only that it was Apple compatible. Indeed, at first, I couldn'd get it to connect properly to my Xperia. Most of the bluetooth keyboards said they required Android 3.0 rather than the 2.3 the phone ran. The keyboard did work with my Sony Tablet S running Ice Cream Sandwich, so I had hope that the upcoming rollout of ICS for the Xperia would fix the issue. And it did! Switch on bluetooth on the phone, switch the keyboard on and wait to be asked to type in a four digit code. It took me a couple of goes, but I got it running pretty quickly. The keyboard includes a combined cover/phone stand which unfortunately doesn't stay upright when placed on a table. I suspect that you are supposed to hold it in your hands and type with your thumbs. The phone is not held securely by the cover. I'm not sure it it would work better with an iPhone. The key action is quite nice, especially when compared with many of the other small keyboards I tried. The major issues are that numbers are only accessible in conjunction with the Alt key and the space bar is very small. But all in all I'm quite impressed and look forward to further real world testing.